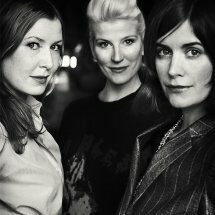 Front is a group of Swedish designers that include Sofia Lagerkvist, Charlotte von der Lancken and Anna Lindgren. Front's creations are based on common debates and experiments, where objects often tell a story. For example they assigned an important part of the project process to animals, computers or machines. They worked on the concept of continuous transformation, created with explosions, robotic furniture and a collection of pieces of furniture inspired by their fascination towards magic. Partnerships are an important part of their work. They worked with robot engineers, magicians, glass blowers, electronic engineers and pyrotechnicians. Front created products for companies such as Kartell, Established & Sons, Moroso, Moooi, Porro, and Höganäs Keramik.